circuitcity has no other items for sale. The Health HP-STX Ultra rechargeable Toothbrush featuring the Sonic wave technology removes plaque and bacteria with 34,000 strokes per minute and three cleaning modes. The toothbrush heads have rounded medium stiff bristles for an effective but gentle cleaning. 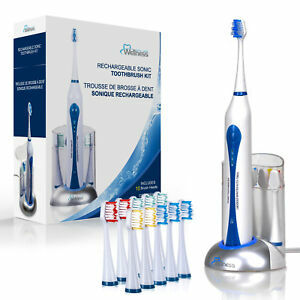 The built-in timer ensures observing the recommended brushing time by shutting off after 2 minutes. Sales tax may apply when shipping to: CA*(7.5%), IA*, MN*, NJ*(6.875%), NY*(8.875%), WA*. Payment Policy All payments with Circuit City must be made through PayPal or a Visa, MasterCard or American Express and are due at the time of purchase, prior to shipping. All Bidders - We accept Paypal only. NYS Sales Tax - We are required to collect sales tax from New York residents. seller A +++++++ thanks !!!!!!!!! Does a great job of cleaning! I really like this toothbrush , ever since i have had it I have been getting good feedback from the dentist. I also like the built in 2 minute timer so I know when to stop and the 3 different speeds are convenient as well. The only problem I have had is with the charging base. It is very sensitive to any drop of water, so when I rinse my toothbrush off I make sure to dry it so I do not ruin the charging base like I did previously. Other than that minor issue it works great. I think the brush does a great job cleaning. Not sure how durable it will be as I've only had it a couple of weeks. So far it's great. The only complaint I have is that I don't like having to press all the different speeds whenever I turn it off. A minor issue. This is nice, but I'm use to the Oral B which does t rotate the entire shaft. That shaft turning feels very weird if it hits your teeth. I do like the fact it's rechargeable. And, it feels good on my gums, but takes longer to clean my teeth as the head is rather small. 100% Satisfied with performance of Oral Care Wellness. After 10 years of use, I finally wore out my Phillips SonicCare. My new Oral Care Wellness performs as well, if not better. I say better because my new Oral Care sonic toothbrush has 3 settings, including gum massage. It has an ultraviolet light to disinfect the brushheads, and cost about 1/3 the cost of my old model. I truly am 100% satisfied with my new Oral Care Sonic.